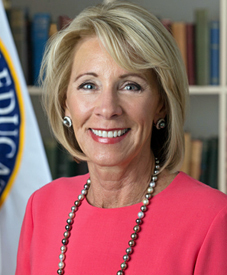 Education Secretary Betsy DeVos/U.S. Department of Education. The U.S. Department of Education on Friday announced that it will engage in rulemaking regarding schools’ Title IX responsibilities involving campus sexual misconduct complaints, and in a question-and-answer document said that there’s no longer a requirement that institutions use a preponderance of evidence standard when determining whether an assault took place. Additionally, the accused will have greater access to evidence, Politico reports, and accusers’ identities must be revealed before questioning. “This interim guidance will help schools as they work to combat sexual misconduct and will treat all students fairly. Schools must continue to confront these horrific crimes and behaviors head-on. There will be no more sweeping them under the rug. But the process also must be fair and impartial,” said U.S. Department of Education Secretary Betsy DeVos, the Detroit Free Press reports. Earlier this month, DeVos indicated that the department’s 2011 guidance would be nixed. “Washington has burdened schools with increasingly elaborate and confusing guidelines that even lawyers find difficult to understand and navigate. Schools have been compelled by Washington to enforce ambiguous and incredibly broad definitions of assault and harassment,” she said in a speech at George Mason University. In June, the ABA’s Criminal Justice Section’s Task Force on College Due Process Rights and Victim Protection issued a report (PDF) advocating that both parties in campus sexual assault investigations should receive written notice before the investigation begins, and they should both be allowed to review the school’s evidence, respond to the final report, and have the right to appeal. Wendy Murphy, a Massachusetts lawyer who represents women who claim to have been sexually assaulted on campus, objects to the task force recommendation, and in 2016 started a petition on the Parents United Against Sexual Harassment website, urging the ABA to rescind its position. Some of the positions have been changed since then, according to Murphy, but she still objects to the report. She plans to file a lawsuit against DeVos’ reported policy change, either in state or federal court. The task force recommendation findings were unanimous, and not designed to benefit one side over the other, Andrew S. Boutros, a Seyfarth Shaw partner who chairs the group, told the ABA Journal. He adds that individuals involved in the process included judges, prosecutors, and victims’ rights advocates.